All you need is five ingredients ~ six if you include the topping. So it’s perfect for the pantry challenge. I found this recipe while various blogs were having a countdown to 2012. Each day they were posting their top recipes in different catergories. Recipe Shoebox listed this as one their top recipes in the dessert catergory. It looked so easy that I made it for New Years Eve. 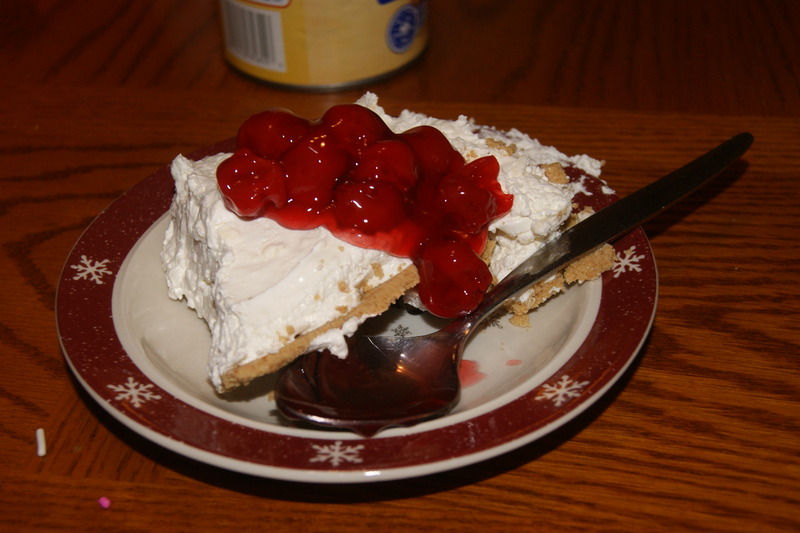 Hubby and I enjoyed it and over the next few days, I finished up the whole cheesecake. It was so delicious. In a large bowl, cream together cream cheese, sugar (or pudding mix), and lemon juice (if using) until smooth and lump free. Mix in Cool Whip just until thick, creamy, and combined. Pour immediately into prepared graham cracker crust. Refrigerate at least 4 hours (or if you’re in a hurry, stick in the freezer for 1-2 hours) or until set. Last summer, my aunt left me a mesage on Facebook about Tropical Smoothie giving away a free smoothie if you came in with flip flops on. The boys and I jumped on that deal. As a result, the Imaginative One fell in love with the strawberry banana smoothie (don’t remember it’s real name). Once I got the smoothie maker, the Imaginative One and I decided to try to recreate the smoothie. I had to add a little of this and a little of that before the Imaginative One gave his seal of approval. These are not exactly like the smoothies from Tropical Smoothie but are similar. Put all of the ingredients in a blender or smoothie blender cup. 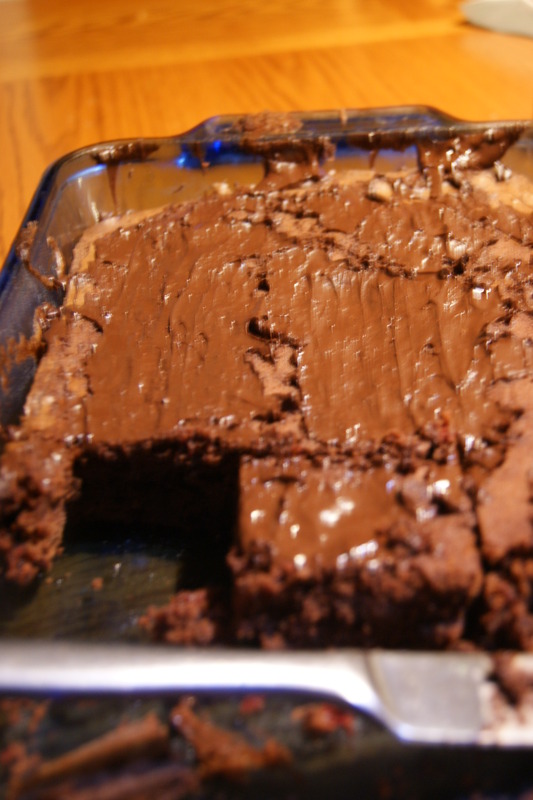 These brownies are made from scratch and are the best I’ve tasted. They are easy to whip up and use items found in my pantry. :) You can adapted them to your liking. Today I had Andes’ peppermint chips left over from my Christmas baking. I decided to put a handful or two in the batter and use peppermint extract instead of vanilla. I absolutely love chocolate and mint flavor combination so I can’t wait to have them after dinner. Heat sugar and butter in a medium pot over low heat until butter is completely melted, stirring often. Remove from heat, stir in 1 1/2 c. chocolate chips until melted. Let the chocolate, butter, and sugar mixture cool until it’s at room temperature. In a small bowl, briefly whisk the eggs. Add 1 to 2 tablespoons of chocolate mixture to the eggs and stir to combine, just to temper eggs. Then pour all of the eggs into the pot with the melted chocolate. Stir to combine. Stir in flour, vanilla, and baking soda until well blended. Pour into a greased 13 by 9 casserole dish and bake at 350 degrees for 18 to 22 minutes. When the brownies are done and still hot, sprinkle remaining 1/2 cup chocolate chips on top. Cool before serving. This post is linked up to Everyday Mom’s Meal: Church Supper. Here are some recipes that can be made from items in your pantry. 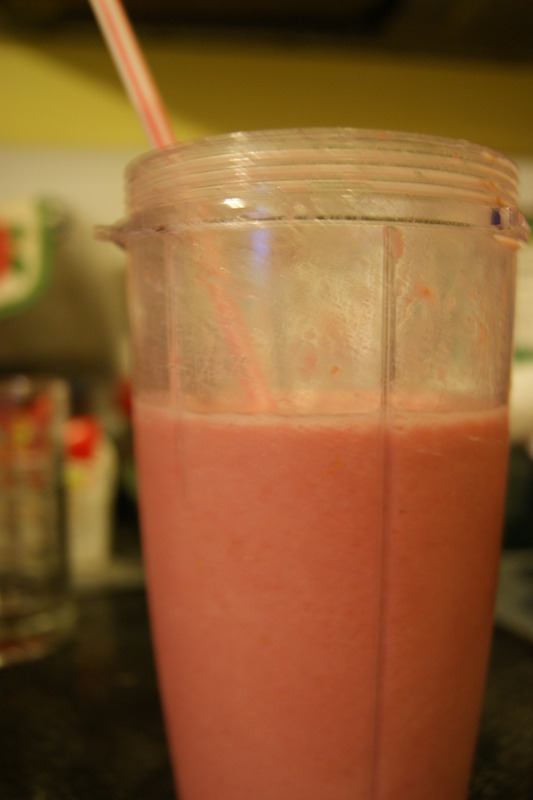 Fruit Smoothie – Use any frozen fruit you have on hand, juice, and even any yogurt. Be as creative as you like. Sloppy Joes – As long as you have some hamburger in your house, you can whip up some sloppy joes. If you have enough time, you can also make homemade hamburger buns to eat the Sloppy Joes on. Save some of those sloppy joes for a Sloppy Joe pizza later. Baked Spaghetti – Again you can use whatever meat you have in your fridge or freezer. Use whatever cheese you may have in your fridge – okay maybe not bleu cheese. If the cheese is not shredded, shred it yourself. Ranch Chicken Legs – As long as you have chicken (doesn’t have to be just legs – use chicken breasts or thighs), Bisquick or something similar, and dry ranch dressing packet (or the ingredients to make your own), you can cook this simple main dish. Taco Crescent Bake – You can switch this up with cooked chicken or even ground turkey. You can try different cheeses. This is a great main dish. Don’t have tortilla chips but have tortillas, make your own chips. Orange Chicken – I usually keep the ingredients for this simple dish in the freezer (popcorn chicken) and pantry (orange sauce) for an easy meal. Crockpot Ribs – You can use this same method for chicken or even a pork roast. Use whatever barbecue sauce you have on hand. Spanish style chicken noodle soup – This recipe calls for raw chicken. I’ve made it with cooked chicken. You can use frozen corn or canned corn. You can use dried black beans or canned black beans. If you use the dried beans, make sure you prep it beforehand. Saturday – Eat whatever you want night – Don’t know when the boys will be back from their cousins so we are going to have a relaxed plan for dinner. Hubby and I are going to Chinese for lunch to celebrate the Chinese New Year so we will be pretty full from that. Monday is Martin Luther King Jr.’s birthday holiday. This morning the Wee One started talking about the holiday and how it does not matter what color a person’s skin is because God made you the way you are. It made my heart melt listening to the wisdom of a 6.5 year old. In October, Finding Joy in my Kitchen hosted 31 days of Cooking from Scratch. She showed you how to make homemade bread, breakfasts, etc . . . One of the recipes was for homemade tortillas. Since October, I’ve wanted to make homemade tortillas. So today I took the time out and made some. They were fairly easy. Time consuming but otherwise easy to make. Add the olive oil, sea salt, and baking powder. Stir well to combine these ingredients. Place the bowl on the mixer and attach the dough hook. Allow the mixer to knead the dough for 5 minutes until the dough is combined and fairly smooth. Shape the dough into a ball and cover, allowing the dough to rest for 10 minutes. After 10 minutes, cut dough in half. Slice each half into 5 rolls. Form balls out of each slice, cover, and set aside for 10 minutes. Do not grease the griddle or skillet if it is non-stick. If you normally grease the griddle or skillet, use butter or olive oil. Allow the tortillas to cook for 5 minutes/side. Watch carefully to make sure they don’t get too browned. 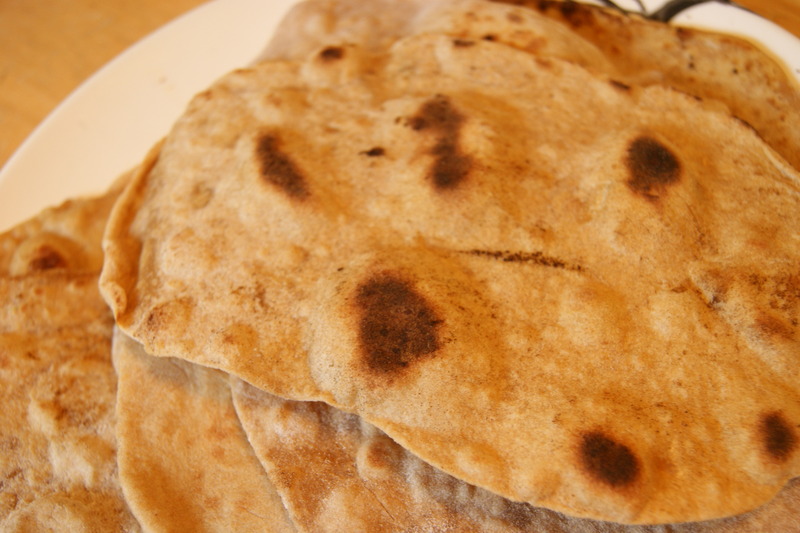 Place cooked tortillas on a large plate. You can put them in the fridge after they cooled for 3 to 4 days or freeze them for a few months. For directions on how make the tortillas without the stand mixer, visit Finding Joy in my Kitchen. Yummy! And healthy! That’s two words that describe these smoothies. Right before Christmas, I bought an individual smoothie maker with cups for a Christmas gift for the whole family. The Imagative One and I love making and drinking smoothies. He also likes to drink milk shakes made with the smoothie maker. I will share his favorite smoothie on a different post. Put all the ingredients in the individual smoothie cup or blender.